'That is important for Modi politically when he launches a do-or-die campaign seeking a renewed mandate in the 2019 poll,' says Ambassador M K Bhadrakumar. The informal summit of Prime Minister Narendra D Modi and Chinese President Xi Jinping at Wuhan (April 27-28) triggered a range of opinions abroad. The Moscow think-tank Valdai Club recalled with nostalgia the famous 1998 idea floated by then Russian foreign minister Yevgeny Primakov -- Russia, China and India creating a 'Eurasian league'. On the other extreme, the Washington-based Brookings Institution, which is wired to the American security establishment, was confident that the Wuhan meeting was much ado about nothing -- yet another exercise in self-projection and cherry-picking by Modi. The mainstream Indian opinion edges close to the American view, unsurprisingly. The most charitable opinion among our venerable China hands is that the Wuhan initiative is the stuff of maya (illusion) in the ancient Advaita (non-dualist) school of Vedanta. There is, possibly, some heartburn all around that they weren't consulted. However, the idea of the summit itself is startlingly novel -- that the locus of India-China relations can be shifted from the here and now and brought under an overarching canopy of long-term strategic consensus. Of course, Wuhan is a success story for Modi himself. There isn't going to be a war in the Himalayas. That is important for Modi politically when he launches a do-or-die campaign seeking a renewed mandate in the 2019 poll. Again, increased Chinese investments in the Indian economy would create jobs and enable Modi to claim political success in his 'development agenda'. Again, confidential exchanges took place in Wuhan to harmonise the two countries' regional policies. After what seemed an eternity, the two countries once again exchanged views on an 'Asian Century', 'strategic autonomy', 'independent foreign policies' and so on. Wuhan took place at a time when world alignments are phenomenally changing and the Western dominance of the international system is drawing to a close. 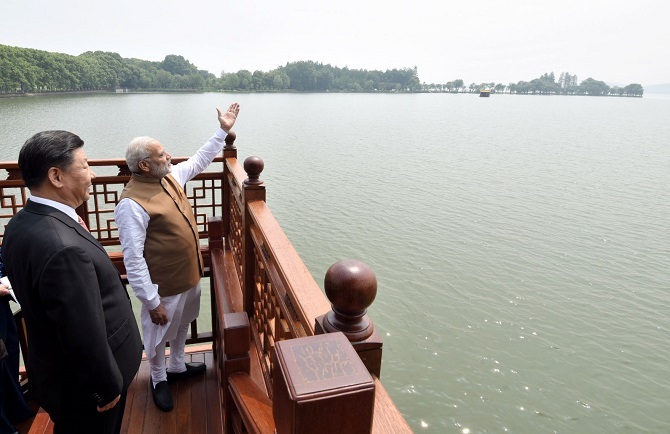 Modi's political instincts couldn't have missed the bankruptcy of his government's flirtation with hardline policies toward China pursued during the period since the (in)famous Joint Vision Statement regarding the Asia-Pacific region with then US president Barack Obama in January 2015 and culminating in the resurrection of the moribund 'Quad'. Our press release on Wuhan invoked the regional and global significance of the summit not less than 11 times. It underscored that 'Informal Meeting' finds habitation and name as a new platform for forward-looking dialogue to raise the level of strategic communication with China. These are all brilliant things and PM Modi is entitled to take credit, since the initiative on 'Informal Meeting' is entirely his idea. However, fundamentally, our foreign policy is 'Nehruvian' -- highly personalised. Under Modi, this has been taken to an extreme. What the Chinese scholar proposed is also an accurate description of the problem. No doubt, a seminal event such as Wuhan must rest on the firm foundation of national opinion. Whereas, the Indian public harbour stereotyped notions regarding China, which successive governments have handed down. Fortunately, in our hopelessly fragmented body polity today, the government still enjoys a free hand to educate public opinion regarding the criticality of coming to terms with China's rise. The political opposition has no desire to attack Modi for improving relations with China. But, curiously, there is no visible effort on the government's part to moderate the public opinion. A beginning must be made -- the sooner the better.